With four qualifying sessions done at the second round of the World Rallycross Championship at Hockenheim, Mattias Ekstrom has come out at the head of the Intermediate Classification. Ekstrom, who has got a rather action packed weekend, juggling both WRX and the DTM season-opener in back-to-back races, won the first Qualifying Heat yesterday. The fact that he managed to finish in the top three in the Q2 and Q3 meant that he took the top spot after the fourth qualifier was done. 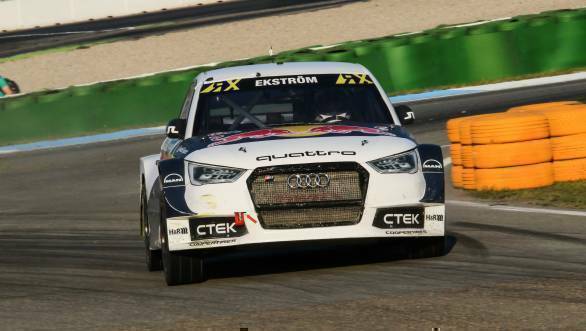 This means that Ekstrom, who drives for EKS RX, will start the first semi-final on pole. In what appears to be a rather good result for the team, Topi Heikkinen lines up alongside Mattias on the front row of the grid. The Finnish driver had emerged victorious in Q4. Pole for the second semi-final goes to Johan Kristoffersson in his Volkswagen Team Sweden Polo RX Supercar. Lining up alongside him is WRX Team Austria's Latvian driver Janis Baumanis in the Ford Fiesta. Perhaps the most spectacular, if somewhat scary, part of the day was when the Team Peugeot-Hansen car that Timmy Hansen was piloting turned into a little fireball. It was then rather surprising to see the same charred car back on the grid and win a race in Q4. However the win was later taken away from the Swedish driver, owing to the fact that his car was found to be underweight.